Wow! 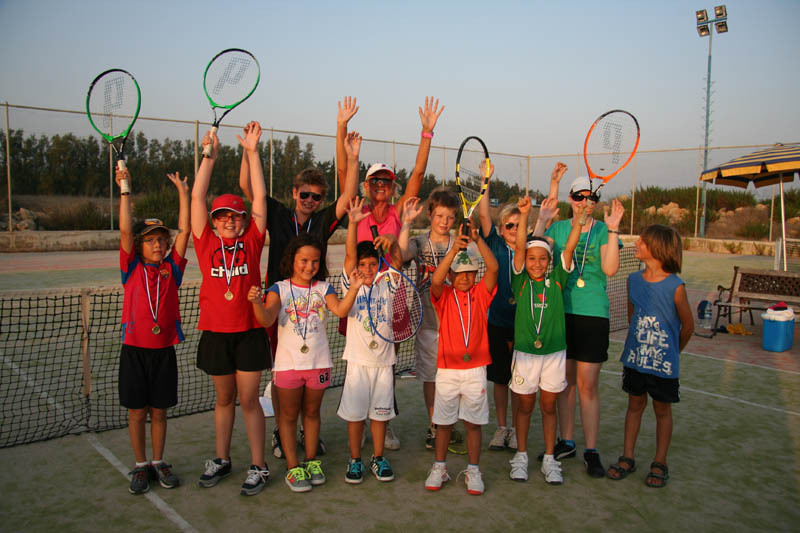 The Summer Tennis Academy finished at the end of July with a bang. A round robin tournament took place on the last day with virtually everyone taking part. It was great fun and competitive, with both a beginners and intermediates tournament. Winner of the Intermediates was Jay from Holland and the winner of the beginners was James from Peyia area. There were also winners of best serve, best return, best forehand, best lob etc. The Summer Tennis Academy featured players from as far away as the USA, UK and Holland and all the pupils worked very hard, sweating in the heat, to really improve their tennis. The beginners made great progress from not being able to play at all to playing matches. Ages ranged from 5 to 11 years old and from complete beginners to those who had been playing for 5 years. I’d like to thank everyone who took part, as well as all their parents for helping to make it such a success. See you next year guys!!! This entry was posted in Cyprus Tennis Coaching, Events, News, Tournaments and tagged Aphrodite Hills, Baghdatis, Children Tennis Coaching, Cyprus, Cyprus Tennis, Cyprus Tennis Coach, Cyprus Tennis Federation, Learning Tennis, Play Tennis in Cyprus, Tennis, Tennis Academies in Cyprus, Tennis Academy, Tennis Centre, Tennis Club, Tennis Clubs in Cyprus, Tennis Clubs in Limassol, Tennis Clubs in Paphos, Tennis Coaching, Tennis Coaching Pafos, Tennis Courses, Tennis Equipment, Tennis Holiday, Tennis in Cyprus, Tennis in Limassol, Tennis in Pafos, Tennis in Paphos, Tennis Lessons Coral Bay, Tennis Lessons Cyprus, Tennis Lessons in Cyprus, Tennis Lessons Peyia, Tennis Lesssons Pafos, Tennis Peyia, Tennis School, Tennis Tournaments in Cyprus, Womens Tennis by Paphos Tennis Coach. Bookmark the permalink.